tuesday tip — know your limits. Hey! Remember me? That girl who used to write this self-love blog thing and then took a vacation to Chicago and consequently fell off the face of the planet? Back and broken, that is. We flew back home to Florida on Saturday, September 10th, and at 6:15 AM on Monday, September 12th, I was taken to the hospital to (finally!) have ACL reconstruction surgery. If that seems a bit crazy to you, to go on a week long vacation in another state and then fly back to IMMEDIATELY have surgery, you’re right. It is crazy. Looking back, I probably would have given myself more turnover time than just a day, but alas. It is done and over with. 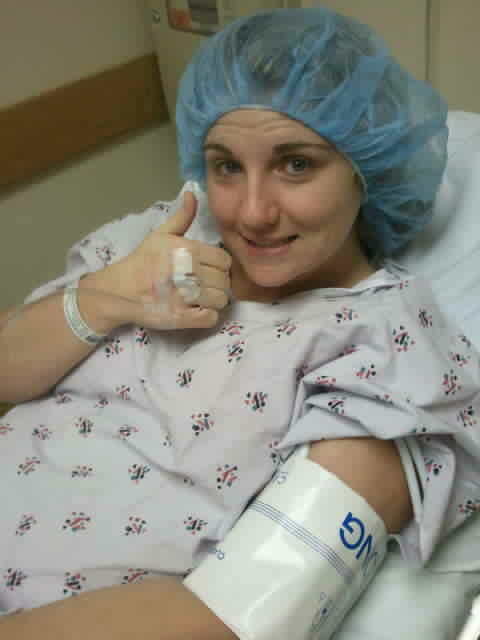 Dan snapped this goody of me right before I was wheeled to the operating room. Had I known that knee surgery is actually a pretty painful and debilitating, I probably would have said, “See y’all in TWO weeks” rather than one. But. I didn’t say that. I said I’d see you in a week. And since I don’t go back on my word, here I am, doped up on hydrocordone and benadryl (the painkillers make me itch like a madwoman) and blogging my life away. Woo! So here’s what I’ve been up to the past 48 hours. Well. The nurses lied to me, because the next thing I knew I was waking up in the recovery room. Dang it, I realized. “I’m supposed to say something stupid” was ACTUALLY my anesthesia yell. How embarrassing. And I did. I used the bathroom all by myself for the first time in days. It was hard. It hurt a bit. But I was finally able to do it. I couldn’t have done that myself. No way, no how. I had to surrender to my limits and rely on those around me. If I would have hopped right out of bed (yeah right) and started jogging down the hall on my own, I would have seriously injured myself. (Or died. I’m just going to go ahead and say I would have died.) I had to swallow a giant dose of pride and let others take the lead on my physical health. I had to let nurses help me as I peed all over myself in my hospital bed, then clutch my PT tech as I limped down the hall before I could do something so elementary as using the bathroom by myself. I had to literally lean on others who actually knew what they were doing before I could go home and face the world on my own using the techniques they had taught me. Your self-love journey operates in the same way. When the anesthesia wears off and you realize that your “anesthesia yell” was something so embarrassing as, “I hate my body,” or “I wish I was someone else,” you’ve got to swallow your pride and learn to rely on others who love you and want to nurse you back to true health. These people may be close friends. They may be counselors. But whomever you choose to reach out to, as long as they’ve got your self-worth in the forefront of their minds, you can trust them to rehabilitate you. It may be messy — you may figuratively pee on yourself around them. You may have to hold on to them for dear life as you learn to walk again. But I promise you. If you let others help you, you will eventually be able to “go to the bathroom by yourself” (that is, truly love yourself) the way you used to before anyone — the media, an abusive significant other, whatever — told you otherwise. I’m glad you’re home recovering! Surgery can be a very humbling experience for anyone! It’s hard to feel so helpless and to have to fully rely on others for even something as basic as going to the bathroom! It took a lot of convincing for me to realize that those I felt like I was a burdon to were actually more than willing to be there for me and they don’t see it as anything more than loving you and taking care of you! Hope you heal fast and aren’t in a lot of pain!